What does the phrase Rapid eLearning mean to you? Is it a set of authoring tools; the timeline for the project; the quality of the output; the budget you have available; or is it eLearning created by a Subject Matter Expert? Does the term inspire you or leave you distraught and desperate? No matter your viewpoint, if you’ve been in the eLearning industry for any length of time, you’ve probably come up against the term. Let’s take a look now on where we’ve been with rapid and where we might be headed. 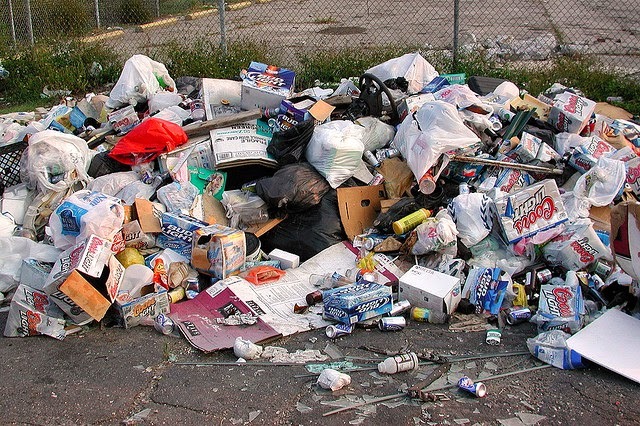 Does Your eLearning Smell Bad? Sometimes a phrase sticks in my skull. And not always in a good way. Last week I read an article in CLO Magazine about blended learning: ”What’s Old is New Again: CLOs aren’t as fond of blended learning as we think” by Giuseppe Auricchio, that had a ring dinger of a quote that I’ll get to in a second. I got started in the business because I can write. I like to think that I have some visual design acumen, but it’s pretty haphazard. The last time I studied the color wheel was probably in eighth grade. And yet eLearning is a really visual medium. We’re communicating with people through the tools of the screen: text, audio, video, images. Layout and aesthetics matter. As designers of learning experiences (and no matter your role in that process—be it a writer of instructional material that you handoff to a graphics team, or a one-stop-instructional design shop where you do it all) one essential skill that you should be honing is visual design. Connie Malamed has written a book just for us: Visual DesignSolutions: Principles and Creative Inspiration for Learning Professionals. In this solid guide, she lays out key visual design theory, making it accessible and applicable to the work we do every day. Connie, also known as “The eLearning Coach”, is one of the coolest eLearning people I know. I consider her a friend and I’ve had the good fortune to eat many a meal with her—chewing our food while also chewing the proverbial eLearning cud. I respect her mind. She is thoughtful, thorough, and really knows her stuff. So consider this review biased. Part I: The Big Ideas in which Connie explains the difference between art and design and exhorts you to “Think like a designer; you are one”. Part 3: Power Principles, in which Connie decodes the color wheel, talks about visual hierarchies, and introduces ways to organize your layouts for greater impact. Part 4: Practicing Design, in which Connie pulls it all together to show how to apply these core skills to create emotional tension, enhance meaning, and tell stories. She presents design concepts and theories that—to a seasoned visual designer—are real foundational stuff, e.g., complementary colors or hierarchies. But she does it without condescending. If your last art class was in middle school like me, then you’ll appreciate Connie’s wonderful re-introduction to the color wheel and the theory behind what’s pleasing to the eye and why. Connie really does want to help you make better learning design. She says this stuff isn’t hard; you can get better with practice. And I believe her. It certainly helps that she’s stuffed this book chock full of examples and non-examples so you can see the difference between a well designed page and a hot sticky mess of one. I know that Connie is not someone to delve lightly into the task of writing a book. She takes her work seriously and aims for perfection. This means that you, the reader, will benefit from all the hours of research that went into this work. As an advance reader, I got a PDF version of the book. Although I don’t mind reading books on a computer, there are some books that just call for a physical reference. I can’t wait to get a hard copy. This is a book that I’ll be flipping through with my fingers to just the right page when I need a reminder about the difference between a hairline vs. a wedge serif, or want to check out that dynamic page layout example that really moved my eye along in a pleasing way. So who’s this book good for? 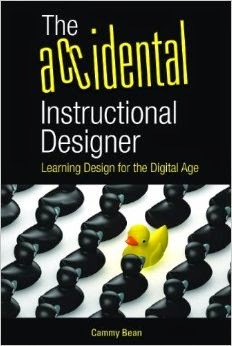 An accidental instructional designer who’s fallen into this eLearning stuff seemingly by…accident. You’re responsible for the entire project soup to nuts and need to gather the content and build the elearning courses all by yourself. You’re now trying to get yourself up and running as quickly as you can. And while you’re great at teaching people in your organization how to follow a tricky process, you’ve never had to create graphics before. A graphic artist who knows your stuff and wants to give an easy-to-understand yet comprehensive graphics primer to the people you work with so you’re all speaking the same language. A graphic artist working in the learning field for the first time. You want to know how things like working memory and cognitive load should factor into the visual designs you create. An instructional designer or eLearning content writer who works with graphic artists. You want to better understand the principles of good visual design so you can write better scripts and define more meaningful graphics for your team to create. An eLearning project team member who reviews courses and talks with clients about eLearning. You want to hone your eye so you can guide your project to a higher quality and explain to your clients why adding a flashing orange button in the bottom left corner just isn’t good design. I’m sure I’ve missed a few others who could benefit from the book. See for yourself! 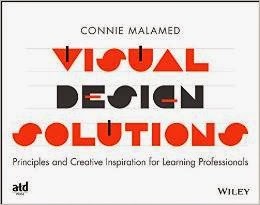 Visual Design Solutions: Principles and Creative Inspiration for Learning Professionals by Connie Malamed. Find it on Amazon and in the ATD book store (discounted for members).